A few years ago, before Jane Kennedy was re-elected as Police and Crime Commissioner earlier this year, the Merseyside Police and Crime Panel agreed to her request for a Deputy Police and Crime Commissioner for Merseyside in June 2014. Previously Jane Kennedy had stated she wouldn’t need a Deputy but changed her mind. 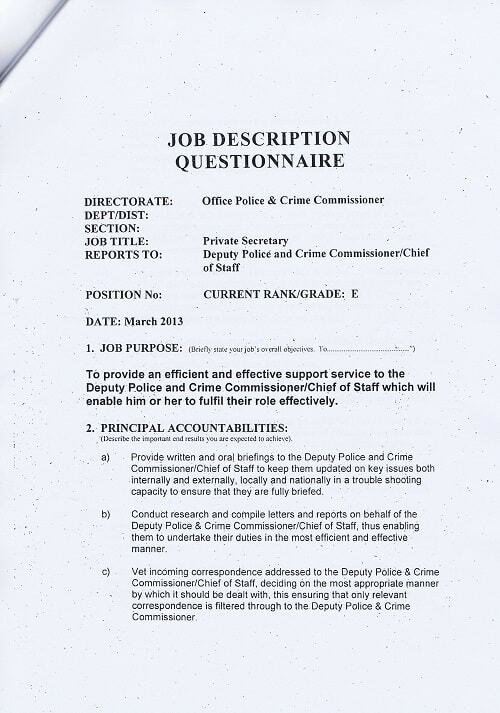 The appointment of Deputy Police and Crime Commissioner (a part-time role of three days a week work with a salary of over £30,000) was first made to Cllr Ann O’Byrne (at the time also Liverpool City Council Cabinet Member for Housing), then in August 2015 the Deputy Police and Crime Commissioner changed to Cllr Sue Murphy (a St Helens Council councillor). Cllr Sue Murphy continued as Deputy PCC until the end of Jane Kennedy’s term of office in May 2016. After Jane Kennedy’s re-election Sue Murphy was then was re-appointed as Deputy Police and Crime Commissioner by the councillors on the Merseyside Police and Crime Panel on the 14th July 2016. In addition to the £31,800 paid to the Deputy Police and Crime Commissioner (from June 2014 to the 1st May 2016, then from 14th July 2016 onwards) Liverpool City Council had been providing a seconded employee (part-time) to be a “Private Secretary” to the Deputy Police and Crime Commissioner at a cost of £16,828 a year. I requested the contract during the audit. In the interests of transparency here is the Secondment Contract Office of the Police and Crime Commissioner for Merseyside Liverpool City Council Private Secretary to Deputy PCC (zipped file). It’s provided as a compressed (zipped file) in case you want to read it (apologies for the poor contrast on the first 5 pages but that’s how it was provided to me). So at least four people with a job and that comes to over £100 thousand a year [ and for doing what? there on more money for three days than most of us earn in a month] then you wonder why you can’t find a policeman when you want one! Well there’s only one Deputy Police and Crime Commissioner at a time (on £31,800 a year) doing a three day a week job (as an employee). The Police and Crime Commissioner has to face an election every four years and receives £85,000 a year. The point about the Police and Crime Commissioner (and Deputy Police and Crime Commissioner) is to represent the public’s views on deciding policy matters to do with the Merseyside Police (such as how much money they should spend each year, how much the council tax precept should go up by et cetera). However this power is exercised in conjunction with the Police and Crime Panel (ten councillors plus two independent members). I think the Police and Crime Commissioner also makes recommendations on who the Chief Constable should be, who the Deputy Police and Crime Commissioner should be etc. Basically the Office of the Police and Crime Commissioner for Merseyside replaced the Merseyside Police Authority in ~2012 (which was made up from I think about half councillors and half independent people).